A day of much celebration as the generations of Skiff children keep coming. As an added treat, the presiding minister was Don McLeod, who baptized much of the previous generation of Skiffs when he was Pastor at the United Church. Sunday, February 28, nineteen folks joined us at Broadway Lanes in Fort Edward. Tons of fun and pounds of pizza were they order of the day. Matthew White goes for a strike. Michael Casey floats one down the lane. On Sunday, February 7th, Carol Skiff was ordained and installed for a two-year term and Ed Skiff was installed for a one-year term. Christopher Fitz and Joan Lapham will serve another three-year term and Mary LeBarron will serve another one-year term. Pictured below: Reverend Bo Harris and Elder Dayle Griffin lead the installation of the elders. Front row, L to R: Christopher Fitz, Carol Skiff, Joan Lapham, Mary LeBarron, Ed Skiff. Back row, L to R: Becky Wright-Sedam and Jackie White. Congratulations to our new and continuing elders. The Souper Bowl of Caring took place on February 7. A delicious selection of soups was available, as well as other goodies. From the sale of "Name Your Own Price" Valentine's items, the Guild was able to buy 40 cans of soup for the Food Pantry. Blank cards were also made available, along with postage to send cards to those in our church family who are not able to get to church on a regular basis. Children were able to create their own Valentine's Day cards, as well. On February 13, from 4:00 - 9:00 pm, Fellowship Hall was transformed into a video arcade of tremendous proportions. About 26 participants competed at games and sang karaoke. It was a fun time for everyone involved! 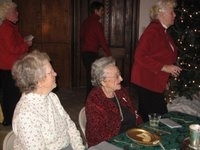 The Ida Whiteside Guild held their annual Christmas dinner on December 8. Co-Coordinators Carol Skiff and Wanda Gay handled the arrangements for the delightful party. 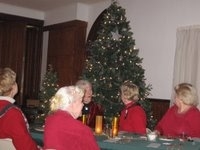 Fellowship Hall was beautifully decorated by SandraHerbst, Sally Infante and Margaret Dixson. Wanda Gay made party favors for each guest, in the form of beautifully tatted snowflake ornaments. A total of 23 women of the church and friends attended the event. About 30 pairs of socks were collected. The socks are given to the elementary school nurse for distribution to children in need. A delicious meal of clam chowder and vegetable soup with a selection of tasty sandwiches was catered by Sally's Cafe in Schuylerville. Equally delectable desserts were provided by Lynne Nunnikhoven of Grandma Miller's Bakery in South Londonderry, Vermont. Musical entertainment for the evening was provided by three teenagers who performed in the Annie Jr. musical at the High School. 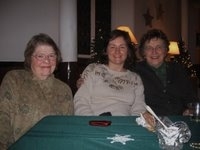 They were Caroline Murray, Ginny Edinger and Annie Roome. They did a fabulous job! 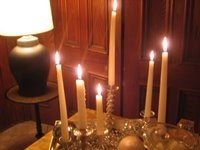 All women of the church are welcome to join in the many activities, bible studies and fellowship that the Guild offers. 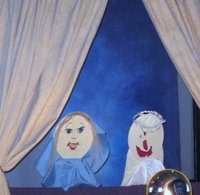 The children of the Sunday School, under the direction of Barb Skiff and Dort Casey, presented a heartwarming Christmas Puppet Show on December 6! The children sweetly sang several songs, including, "Come, Thou Long-Expected Jesus," "There's a Song in the Air," "Away in a Manger" and "The First Noel." 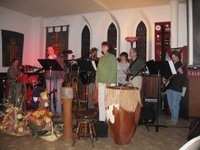 About 25 folks joined us for our semi-annual Coffee House/Open Mic night on November 28. From what we could tell, a good time was had by all. In Galilee played a number of songs, with Warren Wright-Sedam joining them for a couple of numbers. I'll Fly Away, a song played in the film Oh Brother, Where Art Thou, proved very popular. 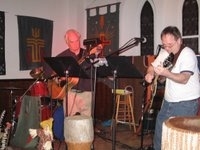 Other performers who joined us included Lisa Towne, Bob Warren, and Tim and Jim Robinson. We gave all proceeds from concession sales at the Coffee House to the Greenwich Food Pantry. Thanks to the generosity of our event goers, we also were able to give the food pantry a full basket of food. Thanks to those who donated baked goods to our efforts, including Mary LeBarron, Carol Skiff, Jackie White, the Wevers, Christopher Fitz, and the Laphams. We want those recipes for the cookbook, bakers!